Home > News > Hot News > Terror Strikes New Delhi-Another black Wednesday in capital city of India! A bomb placed in a brief case exploded at the Delhi High Court in the morning of September 7th, 2011, killing 11 people and injuring over 70. The explosion took place in the reception area at Gate no 5, where hundreds of people had gathered to collect passes needed to enter the courthouse. A crater nearly four feet deep established how powerful the bomb was; police sources say the explosive shows traces of ammonium nitrate and combusted completely, signs of sophisticated bomb-making. The Delhi Police has released two sketches of the man believed to be responsible for today’s terror attack. Afzal Guru has been sentenced to death by the Supreme Court for his role in the attack on the Indian Parliament in 2001. His mercy petition that asks for his sentence to be commuted to life is pending with the Indian President. The explosion took place at 10.15 am – “rush hour” for the courthouse which usually starts hearings at 10.30 am. On Wednesday, Public Interest Litigations (PIL) are heard in the High Court, drawing larger than usual crowds. In the seconds after the blast, lawyers and litigants were seen running for help, their blood-soaked clothes clinging to them. By 3 pm, the High Court was back to work to signal that it remains strong despite today’s attack. But the conversations in and outside court-rooms were about the tragedy. The government will find itself struggling to provide an explanation for why terror continues to stalk cities with relative ease. On July 13, also a Wednesday, three bombs exploded in crowded markets in Mumbai during rush hour. More than 20 people were killed. Islamic fundamentalist group Harkat-ul-Jihad-al-Islami or HuJi has claimed responsibility for the Delhi High Court blast on Wednesday (September 7, 2011) that killed at least 11 and injured over 60 people. Security agencies believe that HuJI (Bangladesh) has been involved in most major terror strikes in India over the past decade. Varanasi bombings, March, 2006: A series of bombings that occurred across the Hindu holy city of Varanasi killed at least 28 people and as many as 101 others were injured. The first blast took place at the crowded Hanuman Temple near the Banaras Hindu University. Hyderabad bombings, August 2007: Two bombs exploded almost simultaneously. The first bomb exploded in Lumbini Amusement Park and the five minutes later at in a popular restaurant. At least 42 people were reported to have died in the two bombings. Delhi blasts, September 2008: Delhi bombings were a series of five synchronised bomb blasts that took place within a span of few minutes at various locations in the capital. At least 30 people were killed and over 100 were injured. 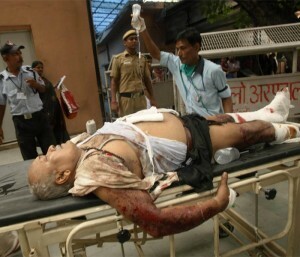 Delhi High Court blast, September 2011: The most recent terror attack at the Delhi High Court killed at least 11 people. HuJi is also suspected to have its hand in other attacks including blasts in Jaipur, Bangalore and Ahmedabad in 2008. HuJI was formed in Pakistan in 1980 to fight the Soviet presence in Afghanistan in the form of organised militia. After Soviets pulled out from Afghanistan, HuJI personnel began looking at Bangladesh as a safe base. However, over the years HuJI’s power and influence gradually declined. In 1992, it got a fresh lease of life when HuJI Bangladesh (HuJI-B) was formed on direct instructions from Osama bin Laden. Its primary aim was to establish Islamic rule and wipe out Indian and Western influence in Bangladesh. It had the slogan ‘Amra Sobai Hobo Taliban, Bangla Hobe Afghanistan (We all will become Taliban, Bangladesh will be Afghanistan). Later, HUJI Bangladesh was to become part of the International Islamic Front (IIF) set up by Osama bin Laden in 1998. Post 9/11, al Qaeda elements from Pakistan are believed to have moved to Bangladesh and joined HuJI, which is believed to have close links with Pakistan’s ISI. Currently, HuJI operations are based out from Bangladesh and Pakistan, but a strong network has been developed across India as well with several alleged HuJI members arrested from the two Indian states of West Bengal and Uttar Pradesh. Ilyas Kashmiri, the operational commander of HuJI, was reportedly killed in a US Predator drone strike in South Waziristan on June 4, 2011. He was linked to the February 13, 2010 bombing of a German bakery in the Indian city of Pune. A statement was released soon after the attack which claimed to be from Kashmiri; it threatened other cities and major sporting events in India. Abdul Sahil Mohammad alias Shahid Bilal, who allegedly built the organisation in southern India and is suspected to have masterminded three terror attacks in Hyderabad – the twin blasts, the Mecca Masjid attack and the strike on Special Task Force. However, there are reports which claim that he was killed in August, 2007 in Karachi. Jalaluddin Mullah alias Babu Bhai is known to be the group’s commander for northern India. He was arrested by the Special Task Force of the Indian state- Uttar Pradesh Police in June 2007. He has confessed to having delivered explosives including RDX across the country since 2004. This includes a consignment to an operative in Delhi beforeone of the blasts. Babu Bhai is also an accused in the abduction of Khadim Shoe’s chief Partha Roy Burman from the Indian city of Kolkata in 2001. Both Bilal and Babu Bhai are believed to have been working for Dhaka-based HUJI commander Munir-ul Islam alias Asadullah.